Discover our ranges of stylish 100% solid hardwood coffee tables, which will bring organisation and style to your living room. A coffee table makes the perfect storage facility and can also double as a stylish focal point, adding both character and functionality to you space. Our coffee tables are made with 100% solid oak, to ensure a long-lasting build that you can rely on for many years to come. There’s a reason an oak coffee table is such a staple in the living room, it’s one of the most versatile pieces of furniture for the home. From its job as the perfect rest for a steamy mug of tea, a stack of the latest copies of your favourite magazine, or the TV remotes, it’s no surprise our coffee tables are so popular. Choose from a variety of styles, from sunny oak to mango wood or painted coffee tables in a range of striking designs. 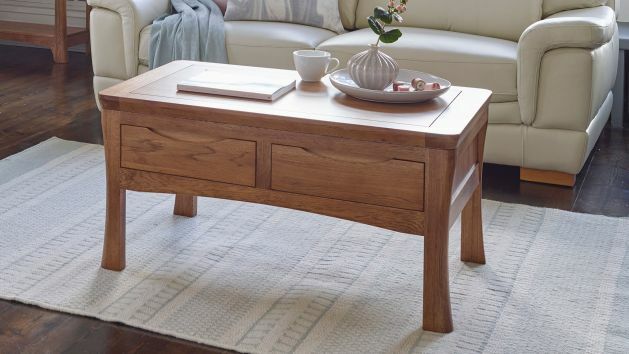 Built from 100% solid hardwood for maximum strength, our coffee tables promise lasting quality. Creating a calm and cosy living room is all about choosing furniture that looks in proportion with the rest of the space. When choosing your coffee table, be sure to measure the height of your sofa from the cushions downwards. Your coffee table should be as close in height as possible to this. When it comes to length, try to opt for one that’s around two-thirds the length of your sofa, so that it can neatly be cantered in front, with an adequate gap either side. Leave a minimum gap of around 45cm between the coffee table and the area surrounding it. This will ensure there is plenty of space to walk around it while still being positioned close enough to provide easy access to drinks and snacks. Add extra flair to your coffee table by styling it to suit the wider décor in your living room. Add intrigue and colour by incorporating a stack of large books or create some height with a bunch of flowers. If you want to display loose items such as candles and ornaments, try placing them in a decorative tray so they’re grouped together neatly. For a minimalistic appeal, opt for a single sculptural piece and let it take centre stage. We have styles from the modern to the more classic, and from the minimal to those packed with drawers and storage shelves to display your favourite items, so check out all our great choices to find your perfect mango, painted or oak coffee table and don't forget that we offer free delivery, straight to your living room. Our flexible finance options are designed to make paying for your new coffee table that little bit easier. If you make a purchase over £500, the payments can be spread monthly for up to four years. If you place an order over £3,500, you can enjoy 0% interest-free credit for up to three years. You can also enjoy free home delivery – we’ll even bring your purchase to your room of choice and give you a courtesy call before we arrive.